The AGA 150 is part of the range of VOX acoustic amps that came out last year. This one pumps out 150 watts but you can also get a 70 watt version and a 30 watt version. What is really nice about this amp is that it has a vacuum tube in one of its two channels which gives it a nice warm and natural sound. This is a very versatile amp packed with features and sounds great! Using a power amp module provided by Bang & Olufsen it produces a super clean and powerful sound, which is great through the 6.5 inch woofer and a 1inch tweeter. Size wise this is tiny compared to a 30W electric combo for example and weighs in at a modest 12 kilogrammes. Looking at the top we can see that it has two channels – normal and tube pre – each of which can take a guitar or a mic but not both at the same time. Ideal if you are a guitar playing singer – plug your mic in one channel and guitar in the other. 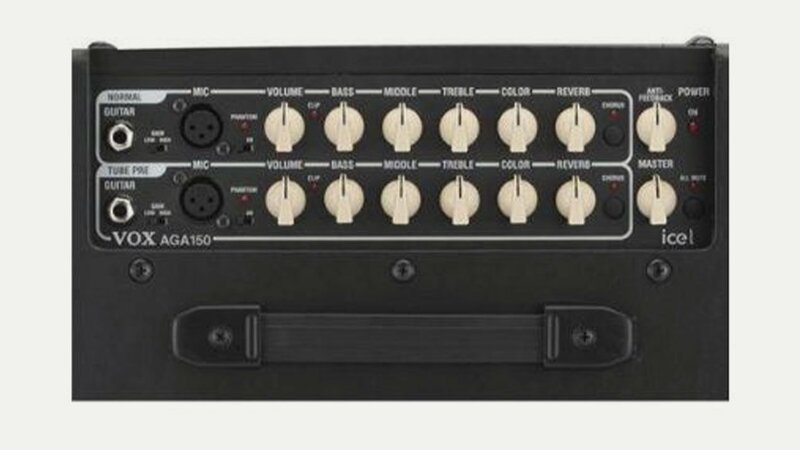 Each of the channels features high or low gain for the guitar input depending on whether the pickup in your acoustic is active or passive, and you get phantom power on the mic input as well. Controls include volume, bass, middle, treble, colour and reverb, together with a chorus switch. Over both is a master volume control and anti-feedback control. You also get a master all mute button – useful for when you plug in or use a tuner. If we turn to the back panel we get a footswitch input – this uses an optional VOX footswitch. A DI out for connecting to a PA or audio interface; a tuner out to connect your tuner, which you can use in conjunction with the all mute button; stereo line in for connecting a keyboard for example and an Aux to connect a CD or MP3/smart phone. One great thing about his amp is its versatility – you can plug in an MP3 with a bass and drum beat to play along to – and on stage connect to a PA outputting your sound and using the amp as a monitor – cool! One thing VOX don’t mention is that you can also plug in a semi-acoustic or hollow body electric and get some great natural tones – how many acoustic amps can do that? The AGA 150 retails around the £400 to £425 mark and the AGA 70 – which has very similar features – about £280 – £300.